Stock # 036811, CUMMINS ISC 330HP TURBO DIESEL, 81877 mi. 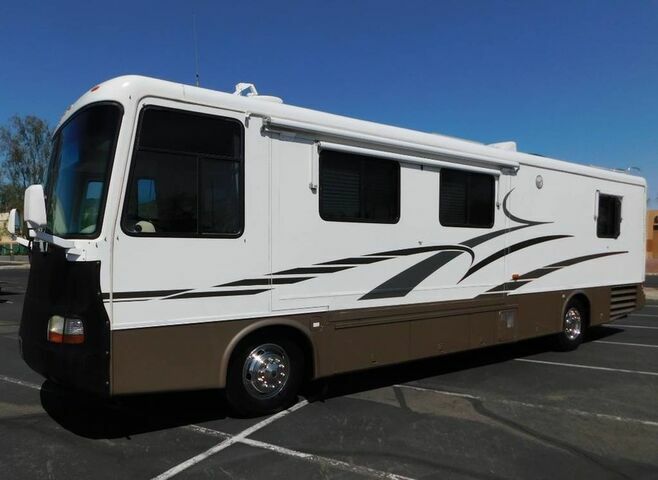 NO RESERVE AUCTION ON THIS QUALITY BUILT NEWMAR MOTORHOME W/ A LARGE SLIDE OUT LOUNGE AND ONLY 81K BABIED MILES! BEST BIDDER WILL OWN THIS RIG WHEN TIME RUNS OUT! THIS 38ft SUPER SLIDE CLASS A MOTORHOME HAS ONLY 81,877 BABIED MILES ON A POWERFUL 330HP ISC CUMMINS TURBO DIESEL ENGINE W/ A ALLISON 6 SPEED TRANSMISSION. ALL SET ON A HIGHLY SOUGHT AFTER SPARTAN AIR SUSPENSION CHASSIS. THE 330HP ENGINE IS EXTREMELY RESPONSIVE AND SAILS EFFORTLESSLY DOWN THE HIGHWAY. FOR THOSE OF YOU WHO ALREADY KNOW. NEWMAR MOTORHOMES ARE CONSIDERED THE QUALITY AUTHORITY IN THIS BUSINESS. THEY BOAST "PRIDE OF THE AMISH" FOR THEIR SUPERIOR SOLID CABINETRY WORKMANSHIP. ALMOST EVERY BUILDER USES SOLID WOOD CABINET DOORS ONLY BUT CUT CORNERS WITH CHEAP BASE CABINETS. NOT NEWMAR! YOU HEAR NOTHING OF THE WOODWORK, WHEN DRIVING A NEWMAR. RVers THAT HAVE OWNED NEWMARS' STAY TRUE TO THE NEWMAR NAME. TRUE CULT FOLLOWING AND THEY ARE ONE OF THE FEW THAT ARE STILL IN BUSINESS TODAY! THIS UNIT IS LOADED WITH ALL THE RIGHT EQUIPMENT LIKE IT'S UPGRADED HD FLAT SCREEN TV, 2 EXTRA LARGE SOLAR PANELS W/ UPGRADED POWER INVERTER, FACTORY WOOD FLOORING THOUGHOUT THE GALLEY/LAVATORY, ONAN 7500 QUIET DIESEL GENERATOR AND SOOOO MUCH MORE. THIS UNIT STARTS, SOUNDS, SHIFTS, RIDES AND DRIVES EXCELLENT. THE EXTERIOR OF THIS UNIT IS AS CLOSE TO PERFECTION AS YOU WILL EVER FIND USED. THE BODY SIDES AMAZINGLY WELL PRESERVED. IT IS OBVIOUS THE PREVIOUS OWNER KNEW HOW TO PROPERLY CARE FOR A RIG LIKE THIS. THE SIDES STILL HAVE A MIRROR REFLECTION WITH ZERO DE-LAMINATION OR DAMAGE. THIS COACH IS 100% EVERYTHING THE PICTURES SHOW IT TO BE. THE INTERIOR IS EQUALLY AS CLEAN AND THE APPLIANCES APPEAR UNTOUCHED. THIS UNIT HAS ZERO SMOKE, PET OR ANY FUNKY ODORS AND EVERYTHING WORKS PROPERLY! FEELS CLEAN, CLEAN, CLEAN INSIDE! NOT A MUSTY TYPE, CREEPY MOTORHOME. PREVIOUS OWNER EVEN HAD A SIGN MADE UP AT THE ENTRY STEPS THAT STATES "REMOVE THEM SHOES"! THE FLOORING, UPHOLSTERY, COUNTERS, CABINETS, DRAWERS AND APPLIANCES' ARE ALL IN GREAT SHAPE. EXCELLENT UNIT ALL OVER! IF YOU AREN'T POSITIVELY AMAZED WITH THE BEAUTIFUL CONDITION THIS RIG IS IN ALL OVER. YOU HAVE NO HOPE LEFT!!!! THIS UNIT HAS BEEN FULLY SERVICED WITH FRESH OIL AND FILTERS IN BOTH THE GENERATOR AND ENGINE. WE HAVE INSPECTED EVERY APPLIANCE AND OPERATING SYSTEM FOR PROPER FUNCTION DOWN TO EVERY LAST LIGHT BULB. THIS UNIT HAS BEEN WAXED, POLISHED AND SPIT SHINED FROM TOP TO BOTTOM. AGAIN, EVERYTHING WORKS PROPERLY. BID WITH CONFIDENCE! OUR EXCELLENT CUSTOMER FEEDBACK RATING WITH EBAY SAYS IT ALL. WE HAVE RECEIVED EVERY TOP AWARD EBAY HAS TO OFFER AND BOAST A+ BETTER BUSINESS BUREAU RATING WITH OVER 16 YEARS IN BUSINESS. WE HAVE BEEN SELLING ON EBAY THIS SAME LENGTH OF TIME AND UNDERSTANDS WHAT IT TAKES TO MAKE A DEAL EASY AND PAINLESS. WE ARE LOCATED JUST 15 MINUTES FROM SKY HARBOR INTERNATIONAL AIRPORT AND WILL PROVIDE FREE GROUND TRANSPORTATION TO OUR DEALERSHIP FROM PHX INTERNATIONAL AIRPORT ONLY. WE CAN STORE ANY UNIT PURCHASED FROM US INDEFINITELY, AT NO CHARGE UNTIL PICK UP. WE HAVE SOLD HUNDREDS UPON HUNDREDS OF RVs TO OUR BROTHERS AND SISTERS UP NORTH OF THE BORDER.WE WILL EXPEDITE ALL REQUIRED IMPORTATION DOCUMENTATION FOR YOU. WE HAVE DRIVERS ON HAND THAT CAN DELIVER THIS BUS TO ANY LOCATION YOU LIKE, WITHIN THE CONTINENTAL U.S. GIVE US A CALL FOR A QUICK AND EASY QUOTE. IF YOU ANY QUESTIONS REGARDING THE CONDITION OF THIS BUS, FEEL FREE TO CONTACT US ANYTIME @ 480-994-1111 OR AFTER HOURS CELL 602-570-7827. THANKS FOR LOOKING AND GOOD LUCK BIDDING!